There is more to setting up a matrix table than the basics. Here are some advanced techniques for tweaking your tables to best display your data. So you've added a matrix table to you report – you're not done yet. Part three offers some tips for configuring matrixes using Report Builder 3.0 to ensure that your data is displayed the way you want it to appear. Now that you've added groups to your matrix, you're ready to resize the cells and configure the properties. You can make these changes at any time, but I find it more efficient to wait until the matrix contains all of the data. Of course, you can add and delete groups as necessary, but this at least provides you with a way to get started. To resize the cells, select the matrix so the thick gray borders appear on the top and left of the screen (refer to Figure 6). Move your cursor to the appropriate line on the border and then resize the cells as necessary. You should experiment with sizing by modifying the cells and then previewing the report. That way you can be certain to display the data exactly as you want it. Now let's look at how to reconfigure the properties. For this example, we'll take it one row at a time. The first row displays the column titles. Depending on the order you added the column and row groups, the titles might not always be displayed in the first row. For this report, however, that's what we want to do. Your column titles should correspond to the data. So the first column is "Order Year", the second is "Order Quarter", and the third is "Order Month". The fourth column is actually an expression -- [SalesGroup]. This means that the name of the sales group will be inserted as the heading. The fifth column should be "Total". 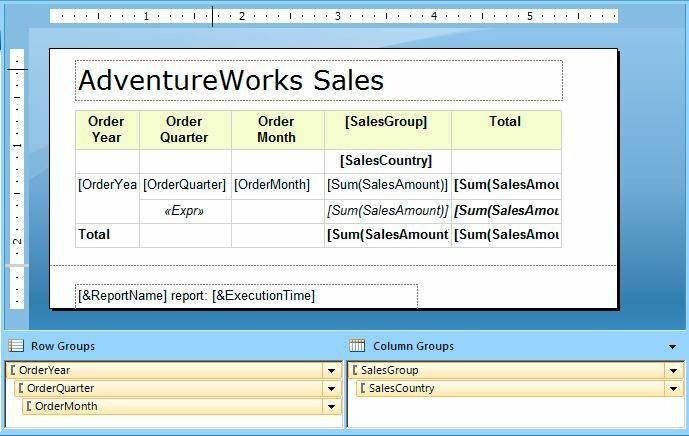 The second row in your matrix should include a label in only one cell -- the [SalesCountry] cell. As with the first row, center the text and set it to bold. If there are labels in any other cells, you can delete those. The expression uses the Iif function to set the color of the rows. If the value of the OrderQuarter column is 1 or 3, the color is set to Cornsilk. Otherwise, the color is set to Ivory. As a result, the row colors for even quarters will differ from odd quarters. This makes the report far easier to read. Another change I made was to center the text in the [OrderQuarter] cell. The expression changes the text box's Value property so the year is included with the word "Total". After you add the expression, center the text. For the fifth row, simply select all the cells and set the text to bold. Also set all the cells in the Total column to bold. You should now configure the data values to display as currency. For each cell that contains a dollar amount, right-click the cell and select Test Box Properties. On the Number page, select Currency as the category followed by the Use 1000 separator option. The expression specifies that the value be displayed as currency, with two decimals and a comma used to separate the digits. Another change you should make is to set how the month names are sorted. In the Row Groups pane at the bottom of the design surface, click the down-arrow next to the OrderMonth group, choose Group Properties, and select the Sorting page. In the Sort by drop-down list, select the MonthNumber column. That way, the months will be sorted by number, rather than name. This way, whenever the report is rendered, the report name is displayed along with the execution time. Now, when you preview your report, it should look similar to the one shown in Figure 9. The figure displays only part of the results. 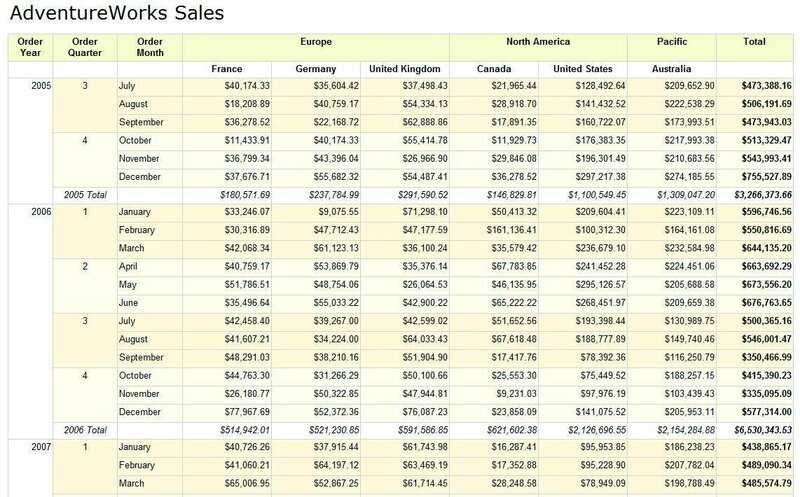 As you can see, the rows are now color-coded according to quarter, the aggregated sales amounts are in a currency format, the annual totals are italicized, and the data in the Total column is bold. You can, of course, make other formatting changes, just like you can add or subtract groups. The matrix provides a powerful tool for displaying aggregated data in a way that can be easily customized and effectively rendered. While this has just been a basic overview, the more you work with the matrix, the more valuable it will become.